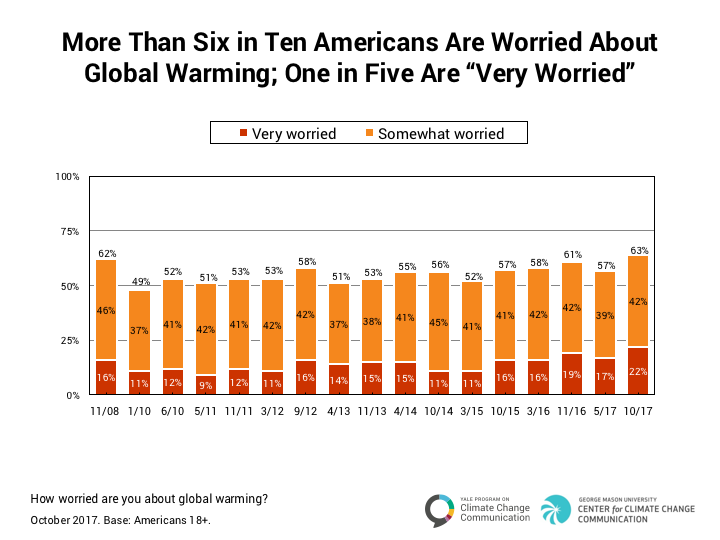 More than six in ten Americans (63%) say they are at least “somewhat worried” about global warming, an increase of 6 percentage points from our previous survey in May 2017, and the highest level since our surveys began in 2008. About one in five Americans (22%) are “very worried,” a five-point increase since May, and also the highest level since our surveys began. 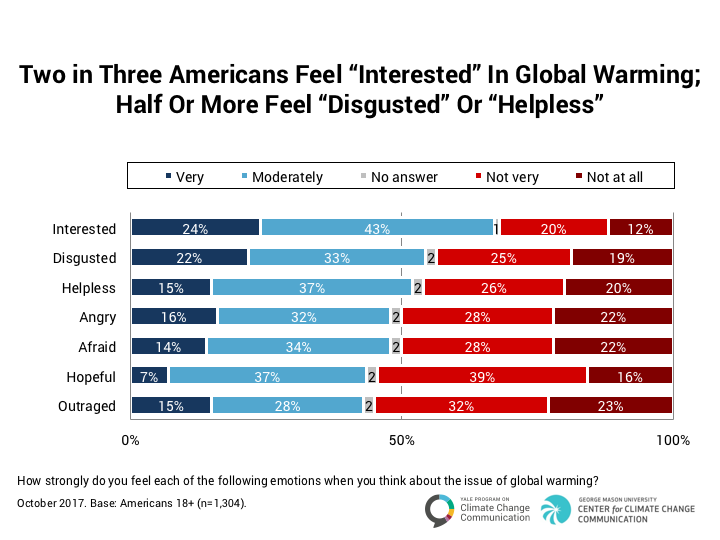 When asked how strongly they feel various emotions when they think about global warming, two in three Americans (67%) say they feel very or moderately “interested” in it, followed by half or more who say they feel “disgusted” (55%), or “helpless” (52%). 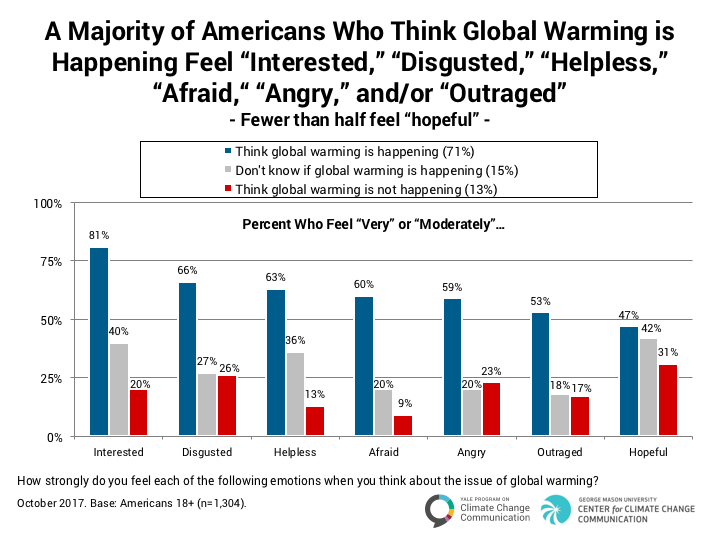 Four in ten or more Americans also feel “angry” (48%), “afraid” (47%), “hopeful” (44%), or “outraged” (43%) when they think about global warming. Emotional reactions to global warming may be felt for different reasons, and signify different meanings depending on an individual’s beliefs about global warming. For instance, someone who thinks global warming is happening may feel “disgusted” about it for different reasons than someone who thinks global warming is not happening. For that reason, we looked separately at people’s emotional reactions to global warming depending on whether they think it is happening, don’t know whether or not it’s happening, or think it is not happening. Eight in ten (81%) Americans who think global warming is happening say they are very or moderately “interested” in it. Half or more feel negative emotions, including “disgusted” (66%), “helpless” (63%), “afraid” (60%), and/or “angry” (59%). Slightly fewer than half feel “hopeful” (47%). 5. Can Humans Reduce Global Warming? Leiserowitz, A., Maibach, E., Roser-Renouf, C., Rosenthal, S., Cutler, M., & Kotcher, J. (2017). Climate change in the American mind: October 2017. Yale University and George Mason University. New Haven, CT: Yale Program on Climate Change Communication. This research was funded by the 11th Hour Project, the Energy Foundation, the Grantham Foundation, and the MacArthur Foundation.